If a current carrying conductor placed in a magnetic field, it experiences a force due to the magnetic field. On the other hand, if a conductor moved in a magnetic field, an emf gets induced across the conductor (Faraday's law of electromagnetic induction). John Ambrose Fleming introduced two rules to determine the direction of motion (in motors) or the direction of induced current (in generators). The rules are called as Fleming's left hand rule (for motors) and Fleming's right hand rule (for generators). Whenever a current carrying conductor is placed in a magnetic field, the conductor experiences a force which is perpendicular to both the magnetic field and the direction of current. According to Fleming's left hand rule, if the thumb, fore-finger and middle finger of the left hand are stretched to be perpendicular to each other as shown in the illustration at left, and if the fore finger represents the direction of magnetic field, the middle finger represents the direction of current, then the thumb represents the direction of force. 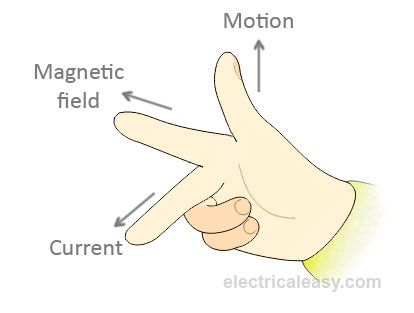 Fleming's left hand rule is applicable for motors. How to remember Fleming's left hand rule? Method 1: Relate the thumb with thrust, fore finger with field and center-finger with current as explained below. The Thumb represents the direction of Thrust on the conductor (force on the conductor). The Fore finger represents the direction of the magnetic Field. The Center finger (middle finger) the direction of the Current. Method 2: Relate the Fleming's left-hand rule with FBI (wait! NOT with the Federal Bureau of Investigation). Here, F for Force, B is the symbol of magnetic flux density and I is the symbol of Current. Attribute these letters F,B,I to the thumb, first finger and middle finger respectively. 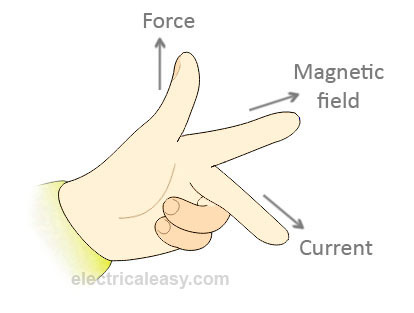 Fleming's right hand rule is applicable for electrical generators. As per Faraday's law of electromagnetic induction, whenever a conductor is forcefully moved in an electromagnetic field, an emf gets induced across the conductor. If the conductor is provided a closed path, then the induced emf causes a current to flow. According to the Fleming's right hand rule, the thumb, fore finger and middle finger of the right hand are stretched to be perpendicular to each other as shown in the illustration at right, and if the thumb represents the direction of the movement of conductor, fore-finger represents direction of the magnetic field, then the middle finger represents direction of the induced current. How to remember Fleming's right hand rule? You can follow the same methods mentioned above for Fleming's left hand rule. In this case, you just have to consider your right hand instead of the left hand.